Your physiotherapist will ask you to walk across the electric pressure sensitive plate, which has thousands of tiny sensors that capture the distribution of pressure on your foot over time. From your scan the computer displays 2D and 3D visual representations of the pressure under your foot as you walk. 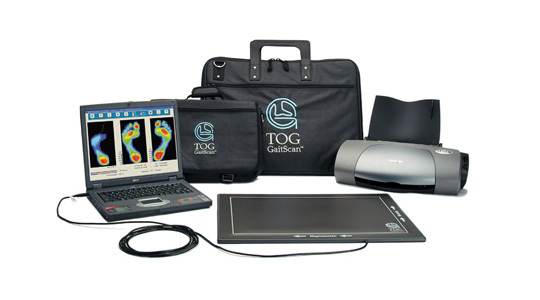 It also produces a series of reports that will be compared to an ‘ideal’ foot scan. Your physiotherapist will discuss with you the results from your scan and reports, and evaluate if the pain you are experiencing is related to faulty foot function, and if so, how best to correct it. There are different options, but if it is determined that you would benefit from custom orthotics, your information is then sent to the laboratory to have custom made orthotics manufactured specifically to your feet. Your new orthotics will generally arrive within 2 -3 weeks.